Direct-reading air quality instruments or monitors provide information at the time of sampling, enabling rapid decision-making. These instruments provide the trained and experienced user the capability to determine if site personnel are exposed to airborne concentrations which exceed instantaneous exposure limits for specific hazardous air contaminants. Air quality monitors can be useful in identifying oxygen-deficient or oxygen-enriched atmospheres, immediately dangerous to life or health conditions, elevated levels of airborne contaminants, flammable atmospheres, and radioactive hazards. 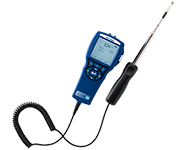 Direct reading instruments are particularly useful for identifying point source contamination or emissions such as gas leaks. Periodic monitoring of airborne levels with a real-time monitor is often critical, especially before and during work activities. Direct-reading instruments are useful for performing screening surveys to determine areas where additional evaluation is warranted. PIDs use a fan or a pump to draw air into the instrument's detector. A high energy ultraviolet (UV) light source ionize the chemicals in the airstream. The charged molecules are collected on a charged surface, which generates a current that is directly proportional to the concentration of the chemical in the air being sampled. The ionization potential (IP) describes the amount of energy needed to induce ionization in a particular chemical. RAE Gas Detection Tubes measure gas or vapor concentrations in ppm. Air samples are drawn through a glass tube containing a reagent. When contaminants are present, color change represents concentrations as measured against a scale. These units use a flame to ionize airborne contaminants. Once they are ionized, they can be detected and measured. Aerosol photometers operate by detecting scattered light. The amount of light reaching the detector is proportional to the number of particles passing through the detection chamber. Also known as nephelometers, these instruments are used to monitor particulate matter such as dusts, smokes, mists, and fumes. They can be used for monitoring the respirable fraction of dust, and are small enough to use for personal exposure monitoring. Results are reported in μg/m3 or mg/m3. Velocity meters (hotwire anemometers) are handheld devices with an extendable wand probe used to measure air speed (velocity). They can be used to monitor the effectiveness of ventilation systems and local exhaust systems. 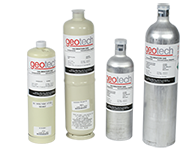 A complete line of gas meter accessories for your air quality instruments. A range of environmental applications can benefit from wirelessly connected gas-detection systems. Today's industrial-grade wireless systems provide reliable safety monitoring that keeps workers and responders safe, and companies in compliance with government regulations. Wirelessly enabled instruments, such as personal and hand-held monitors, also include an alarm notification system that sounds local alarms as soon as a threat is detected. Data from these monitors can also be wirelessly transmitted to a central location for data logging and analysis. This allows organizations to archive information for compliance review, mediation and remediation. Multi-gas monitors incorporate separate sensors for oxygen, combustible atmosphere, and up to three toxic gases in the same handheld monitor. The sample concentration is displayed in ppm, percent oxygen or percent LEL (Lower Explosive Limit), as applicable. Multi-gas monitors typically feature audible and/or visual alarms that warn of IDLH or time-weighted average toxic gas concentrations, low oxygen levels, LEL conditions, or malfunction. These monitors may operate in passive (diffusive) mode, or in active mode, in which a pump module draws air across the sensors. Landfill gas monitors are designed specifically for use on landfills to monitor Landfill Gas (LFG) collection and control systems. Landtec GEM™ Monitors sample and analyze methane, carbon dioxide and oxygen content of landfill gas with options for additional analysis. Designed specifically for the search and location of the highest concentrations of flammable gases. 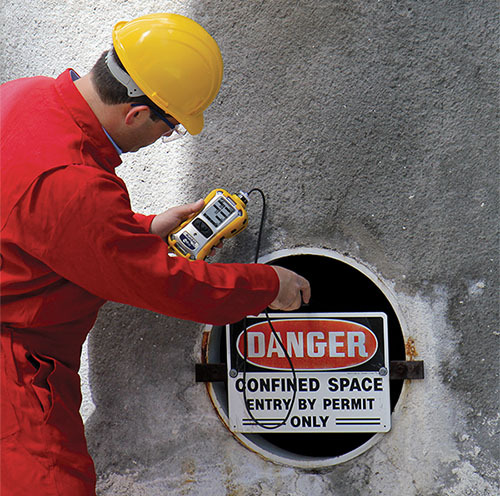 Intrinsically safe models detect almost any known gas or gas mixture. The Geotech High Vacuum Sampler uses it's internal compressor to draw air from a sampling point source and then convey the air into a sealable sample bag. The unit's compressor is capable of producing up to -22 inch of Hg vacuum.